While at York, Weyni Mengesha (BFA 2005) did an independent study that she created with the help of the then Chair of the department, Peter McKinnon. The study was investigating the black Canadian theatre aesthetic which led her to do some work in Nova Scotia with some of the oldest black communities in the country, and assisting Djanet Sears on her play adventures of a black girl in search of God. She also started working on da kink in my hair with Trey Anthony, which was in the early stages of its development. Once she'd graduated, she wrote the music for da kink in my hair and directed it on tours in Toronto, New York, and London. For the next couple of years she went on to direct other shows around the country including d’bi.young.anitafrika’s “Blood.claat” which played Montreal, Toronto, Ottawa and Vancouver. After a few more shows she had the craving to go back to studying so she applied for the director’s position in the soulpepper academy. Upon finishing the two year program she was asked to direct their production of A Raisin In the Sun. This was a success and was remounted a year later. She went on to direct shows for Luminato, Nightwood, and The Stratford Festival. Mengesha is also very passionate about working with young people. She serves as the artistic director of two youth arts initiatives: Sound The Horn, which she co-founded in 2004, and The AMY Project (Artists Mentoring Youths) which she co-directs with Claire Calnan. She is also one of the organizers of the Wrecking Ball, “evenings of political theatre designed to provoke thought and discussion within the theatrical community”. 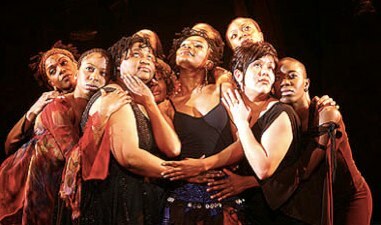 This past year Weyni was the company dramaturge for Volcano’s Another Africa at Canadian Stage, directed Kim’s Convenience by Ins Choi (BFA '98) at Soulpepper Theatre and The Small Room at The Top of the Stairs at Tarragon Theatre (both which won several Toronto Critics awards including best director for Mengesha.) She just finished teaching a scene study coarse at the National Theatre School in October and is taking a break to have a baby due in December. What was the most valuable thing you learned while studying at York? Our second year directing course with Ron Singer is still a major part of my tool kit. He really made us diligent about asking the right questions of our actors and meticulously sifting through our scripts. It sometimes felt like too much detail but upon repeating the exercises and seeing the results you really understand the importance of that kind of investigation. It has made me remain disciplined to this day with my prep work. In which ways has your education at York, and in the Theatre in particular, helped you work in life? The work I did with Mark Wilson around collective creation was very valuable because it grew courage in me to think of myself as a storyteller not just a director. So when we needed music for da kink in my hair I started writing it, when we needed to develop a script for blood.claat I started doing dramaturgical work. In fact coming out of York the only work I did was new play development with people I collaborated with. I did not direct a “published play” until 6 or 7 years out of school. So getting my career started meant having the courage to take risks and collectively collaborate on new projects. Do you have any advice or tips for students just entering the department? Take advantage of all the resources available to you: I put up my own show the summer after my first year and all my designers and production collaborators where my fellow students I met that year. I often would go and talk to faculty about different ideas I had which is how my third year independent study came about. I would have chats with Peter McKinnon about things I wanted to explore that I did not feel I was getting at York, and he was a great collaborator. Take advantage of the risks you can take: once out of school it gets more challenging to find so many potential collaborators who can afford the time to experiment with you on creative ideas.